This year, students in the Terrascope first-year learning community are developing plans for adaptation to climate change, and they are using MIT’s own campus as a living laboratory. Their term-long assignment is to create adaptation plans for MIT and for southern Bangladesh, and to use their plans for these sites to develop recommendations for other areas around the world. 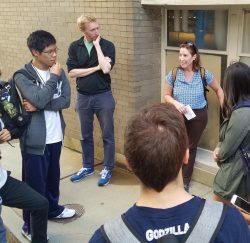 The MIT Office of Sustainability has been a key partner in this project, providing access to information and expertise and even developing a Campus Resiliency Crawl, a series of guided tours conducted specifically for Terrascope’s fall class, 12.000 Solving Complex Problems, and covering four separate topics: buildings, site, utilities and community. The students will present their plan and defend it in front of a panel of experts on December 6 at 7 pm in Room 10-250. The public is warmly invited, and the event will also be live-streamed. Next semester, Terrascopers will design and prototype climate-adaptation devices in Subject 2.00C/1.016/EC.745 Design for Complex Environmental Issues, and they will create a general-interest radio program on the topic in Subject SP.360 Terrascope Radio.